Fifty-five thousand dollars for potato salad… that’s a lot of taters. Last year, an Ohio native named Zach Brown wanted to raise $10 (as a joke) to make potato salad. Using Kickstarter (some sort of crowd-funding site), his effort went viral on the internet and he ended up having Potato Stock (a play on the famous Woodstock music festival in the ’60’s). Doesn’t look like that many people attended Potato Stock, but I hope it’s the start of something fun, maybe an annual Tater Festival in Columbus, OH. Bring on the spuds, Zach! Anyway, what does potato salad have to do with autism and my daughter, Gracie? I mention Zach Brown’s story to draw a comparison to my efforts to raise money and help pay for my daughter’s needs. In the beginning, the intent was to use the money towards getting stem cell therapy for Gracie. Long story, short version, we decided not to pursue stem cell therapy and use any donated proceeds to buy other things (a television, a new bed, medicines, and supplements, all for Gracie). The money quickly ran out, as I only managed to collect a few hundred dollars. It’s literally been years now since anyone has contributed further. However, we were grateful still. Now we’ve come full circle it seems, as this Thursday Gracie will be undergoing stem cell therapy. We’re melting our plastic (going deeper into the debt abyss) and using our health insurance flex-care benefit to cover the $5,000 cost of the treatment. All of it out of pocket, as the treatment is considered experimental still in the USA. Please help get the word out about Gracie’s blog. Share this post and blog with your friends and family. Ask them to do the same. Help us defray the cost of the treatment for Gracie. Click on the ‘Donate’ button, and give only a dollar. Any amount will help. Please take a moment of your time to do so. And for those of you who have already donated, please don’t do so again. I just ask that you spread the word. Finally, the reason for the photo in today’s post… Your $1 and correct guess gets you a chance to win 10% of whatever proceeds we manage to collect. Our goal is $5,000, so easy math here, that’s $500 for the lucky winner. How do you win? 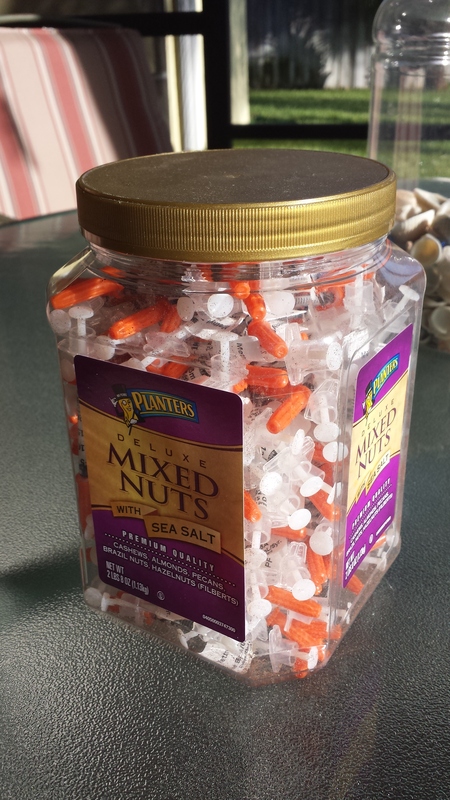 You have to guess the number of needles in the empty mixed nut container we used to collect used methylcobalamine (a B-12 vitamin) syringes. The exact number wins, or the closest guess. The prize will be split equally if more than one person gets the correct answer. I haven’t figured out all the details yet, but send an email to random_walk00@yahoo.com (that’s walk with two zeroes behind it) with ‘GUESS’ in the subject line of your email, tell me how many needles you think there are, and match your email to where your donation came from. If I can’t figure it out, I’ll let you know. We’re going to run this effort thru to October 31, 2015. Hopefully that’s enough time! This entry was posted in Issues and tagged autism, B-12, Columbus, fund raiser, methylcobalamine, Ohio, potato salad, raffle, syringes, tater salad, Zach Brown. Bookmark the permalink.